Yo yo yo yo~~~ GOOD MORNING everybody! It’s really early now – like 5am?? Hahaha..! By the time I finish writing this post it should be….. 9am already! 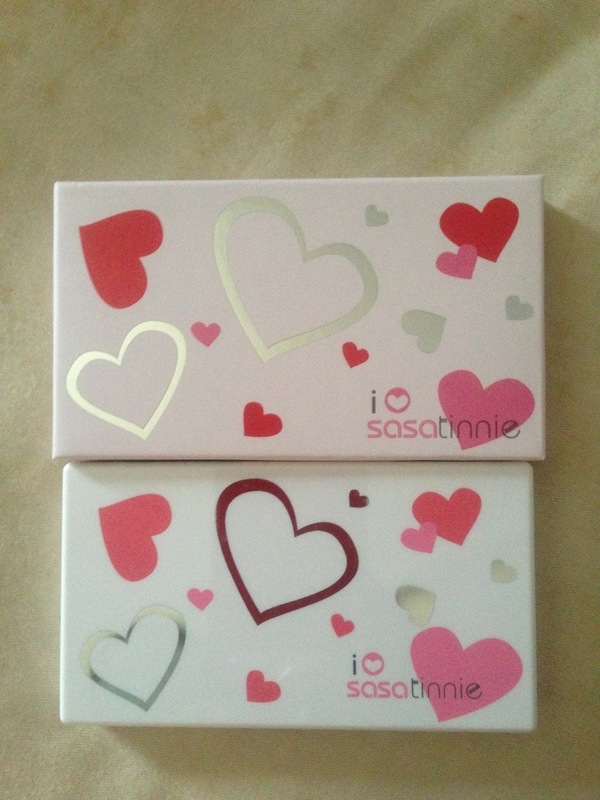 Anyway, that doesn’t matter… Today I’m gonna share with you what I rec’d in my last Vanity Trove! But after they changed their concept, I feel that the surprise is not there anymore and $25 for samples sounds really expensive now.. 😦 none the least, I’ve made it all worthwhile in this trove! Seee!! These are the items I had selected! They arrived in the morning via Ta-Q-Bin courier just before I head out for my long weekend staycation!! Yahoooo! This is the Go60 mask that I had tried in previous trove and I find it AMAZING!!! 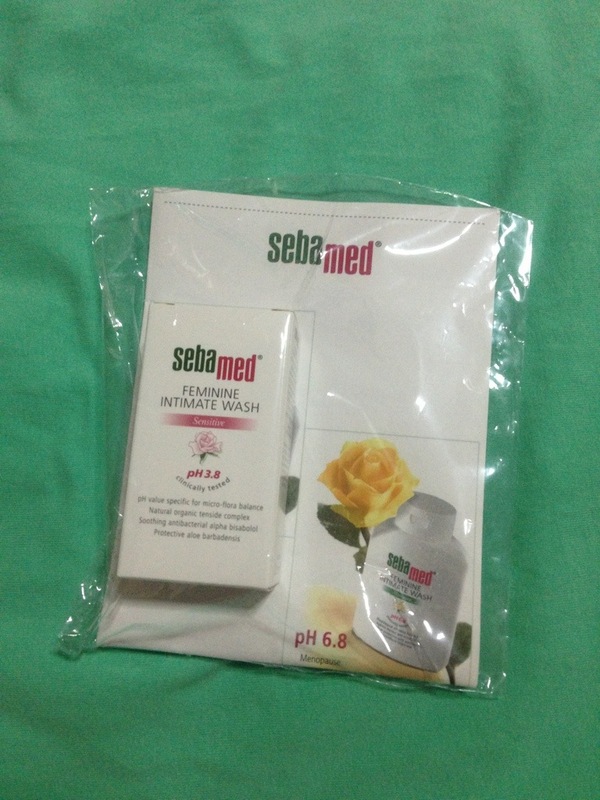 It made my skin ultra smooth and ultimate hydrating!! I feel so wonderful after using it! The smoothness it give is by far the best among all the mask I had use!!! I can’t find much product details online yet but seriously I think u should really try this too if you have the chance!! This is one mask you cannot missed!! Read HERE for more info from my previous post! 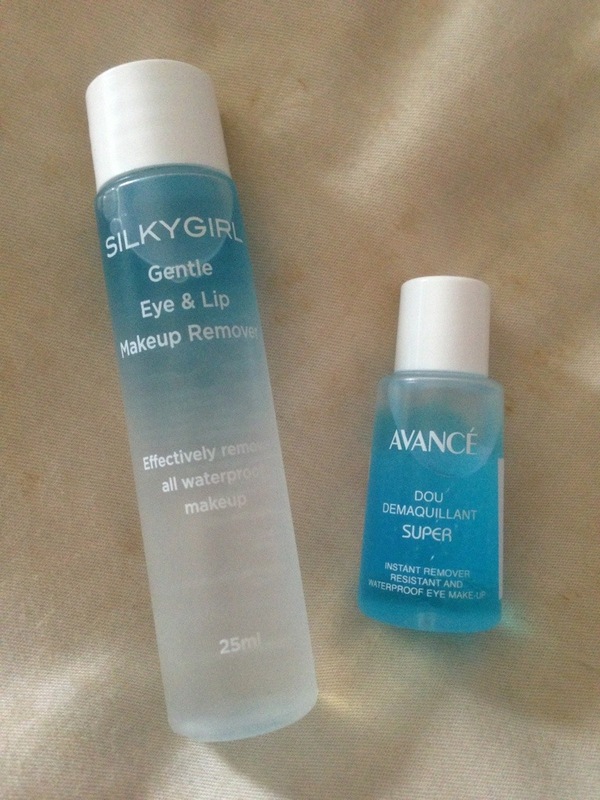 Next up, makeup remover!!! Do you know why I’m so HAPPY to see my trove arrive before I head out for my staycation!? That is because, I can bring along my travel size makeup remover and no need to buy one from Watsons! In my previous trove, I had rec’d Avancé remover before I find them very effective! It works over my expectation! The retail price is about S$28 something at BHG, little costly because the size ain’t very big not even sure if that bottle can last me a month.. 😦 BUT it’s really good you see… You can check out my previous post HERE for more information..
As for Silkygirl’s remover (I brought along for my staycation), I tried it last night and I feel it’s not as effective as Avancé or even Bioderm.. Yes, it does remove my makeup but I keep feeling its not clean enough because I dun see much “brown stain”(bb cream) on my cotton pad and not a lot of eyeliner found too.. Wonder is my face really clean.. Guess what’s this!!? Hahaha… It’s sooo cute!!! Nope! 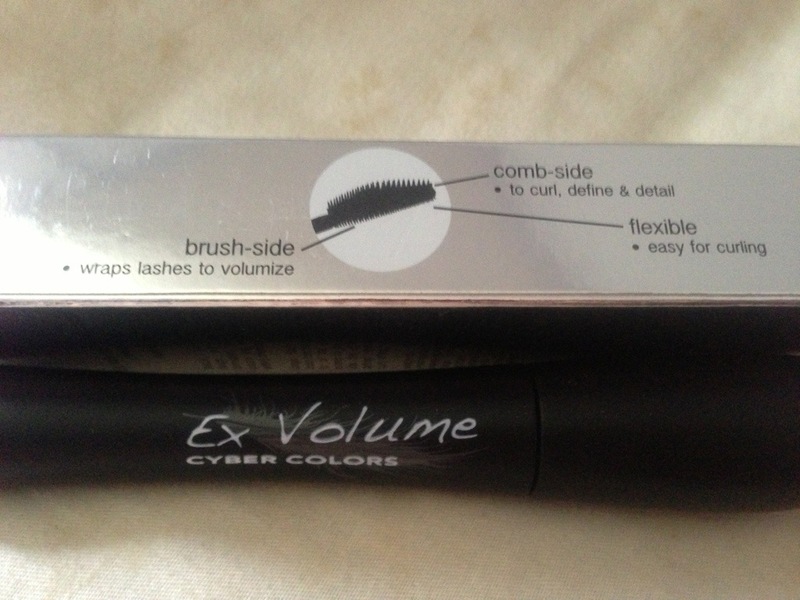 Not eye shadow.. Nope! 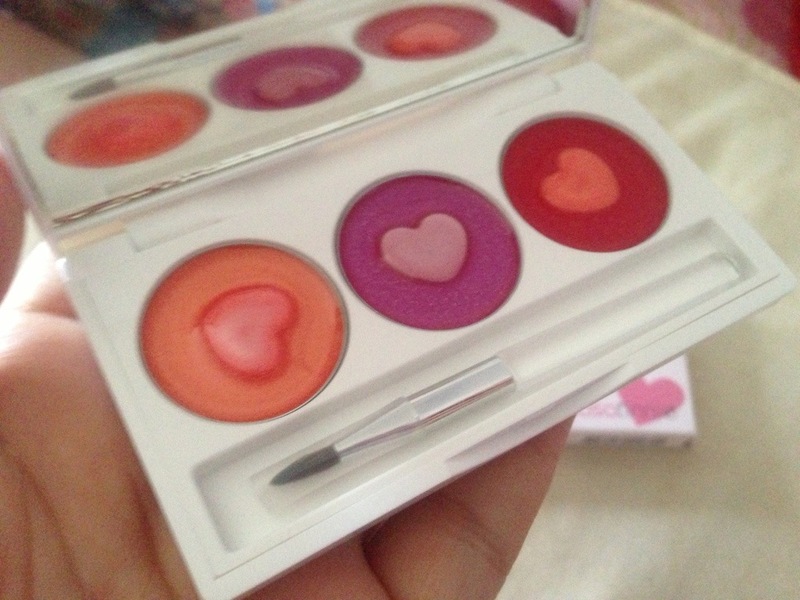 Not blush color.. Definitely not compact powder.. More guess?? Did anyone say lip gloss??? Hahah!! Yes it is!! Comes in 3 color and they not only they look sweet they smell so sweet too!!! So regret I didn’t bring along for my staycation.. Awwww..
And.. My goodness, I didn’t expect it to come in full size.. LOLX! What a bargain!! HAHAHAHA…. 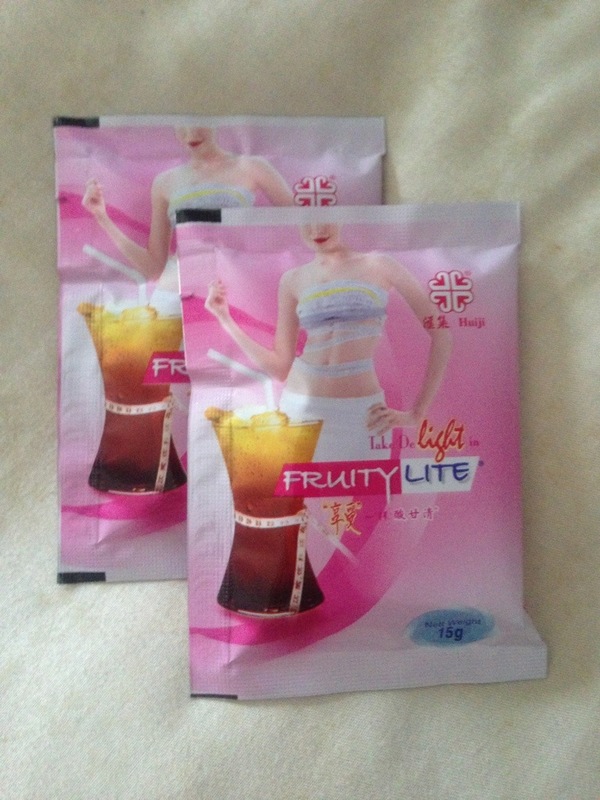 The fruity tea that I mentioned before that I will show you in one of my post!! I seriously didn’t expect it here!!! Hahaha… This taste much better than kilo off tea!!! Seriously, it’s sad to bid goodbye but… We must always move fwd! For the sake of my pocket, I have to stop what I have to stop.. Moreover, seems like there are more and more kinds of sample box being introduced and their selling point? They are FREEE!! But free stuff comes with cons.. The down side is that they are bi-monthly boxes and the products they give I believe won’t be comparable to VT (paying box).. But who cares as long as I get my surprise!! 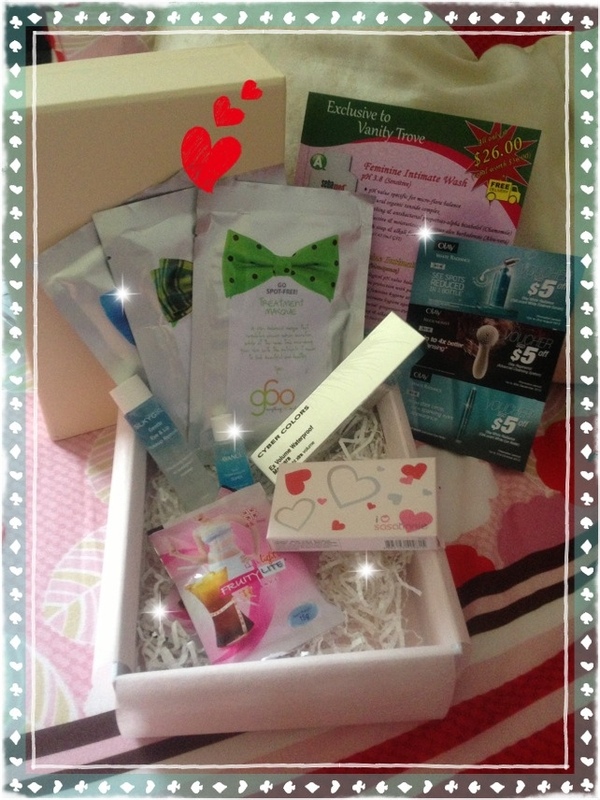 Check out brandbox.sg and blackbox.sg to get your FREE box today! Today is a very tiring day! Why? Because I had my team building today! It was fun seeing how the team play! Anyway, today’s post is not about my team building but…. *drumroll* my amazing mask!!! This is the amount of serum that is still available after I put on my mask! The mask is soaked thoroughly in the serum! 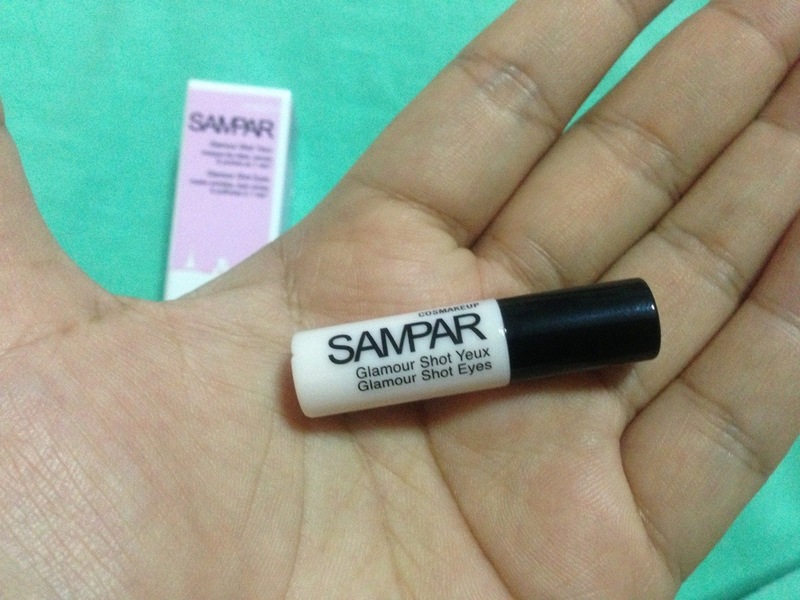 Although u can’t see how good is this serum but.. Trust me(! ), this mask is no kidding! 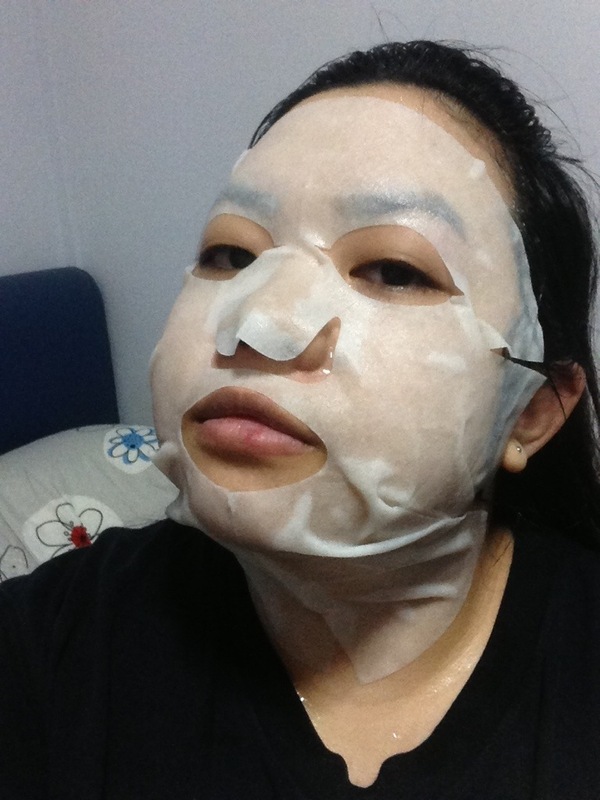 Another thing i like about this mask (other than the generous amount of serum) is the BIG sheet mask! 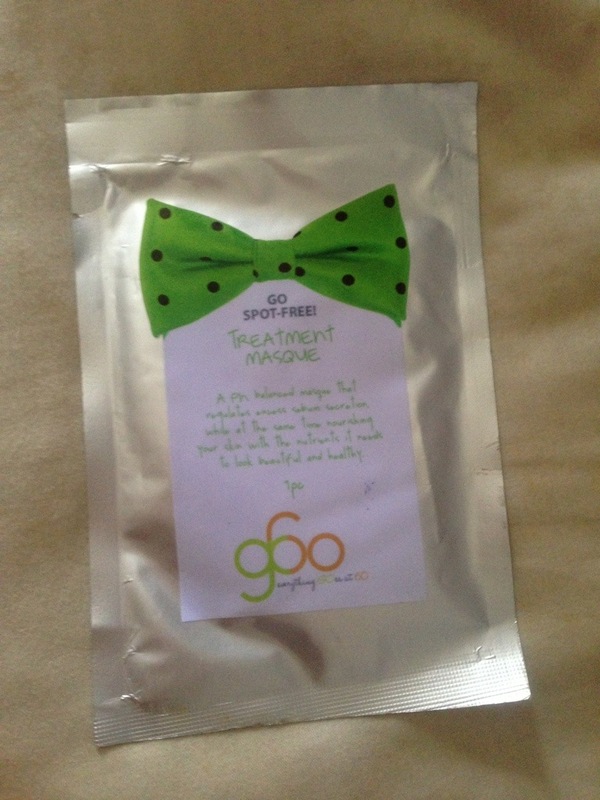 This mask has a “neck section” for you to pamper your neck too! 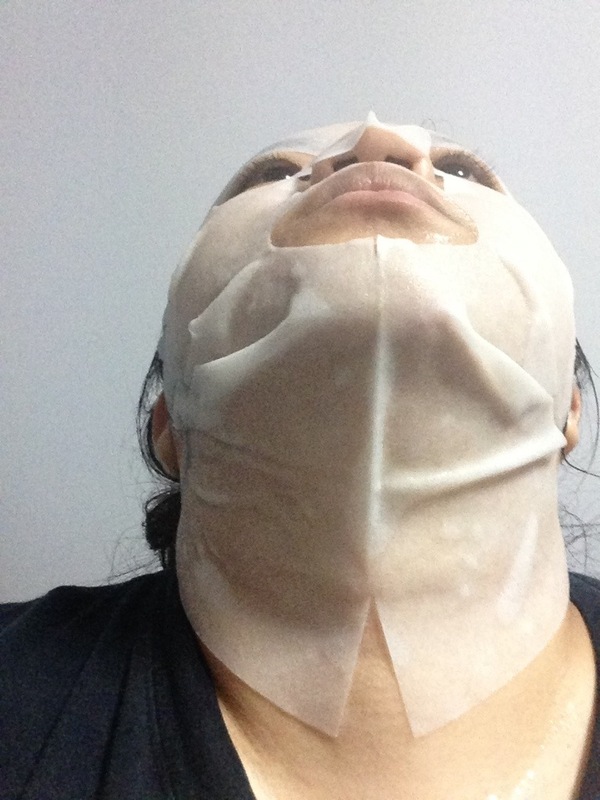 I have very thick broad neck so if u have slimmer neck, I think this mask can easily cover your whole neck! If u ask me, I think I will go get this mask if I happen to come across it! Although 5 for $60 is a bit pricey but I think it’s pretty work it!!! good beauty investment! Next up! Eye mask!!! Eye mask from Mr Morita! 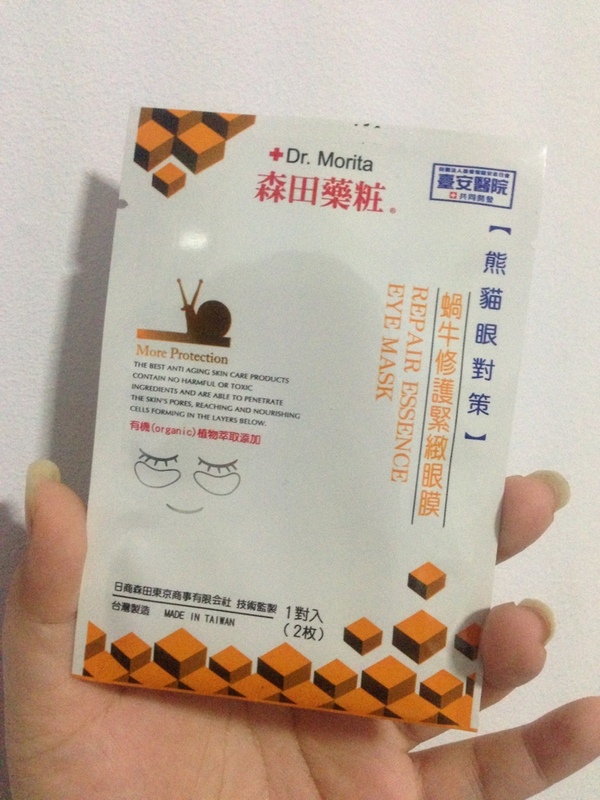 My first time using Dr. Morita’s mask and I’m quite satisfied with it. 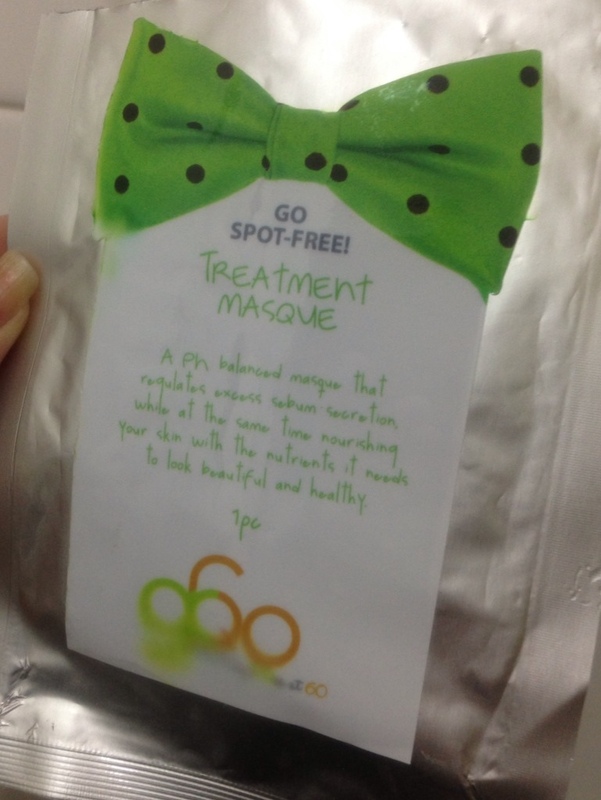 A pack of mask like this packed with generous amount of serum!! See!! The serum is rolling down my cheek! 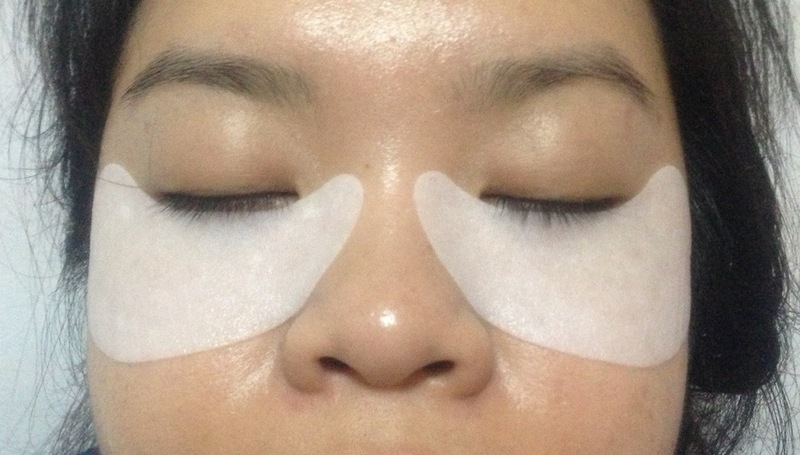 After 15 min, I remove my mask & my eyes feel less tired and less puffy! Well, comparing this two mask, I think I will definitely want to buy Go60 mask!! Tho the high price but the after effect is amazing!! PS: pls pardon my seriously messy hair! I was home having some me-time and randomly decided to do a post like this. That’s why i ain’t prepared!! No time to doll up myself.. hahahaha! It’s time for Vanity Trove again!!! Yippie!!! This month’s trove is pretty my type.. Hahaha! Many items and useful items!! 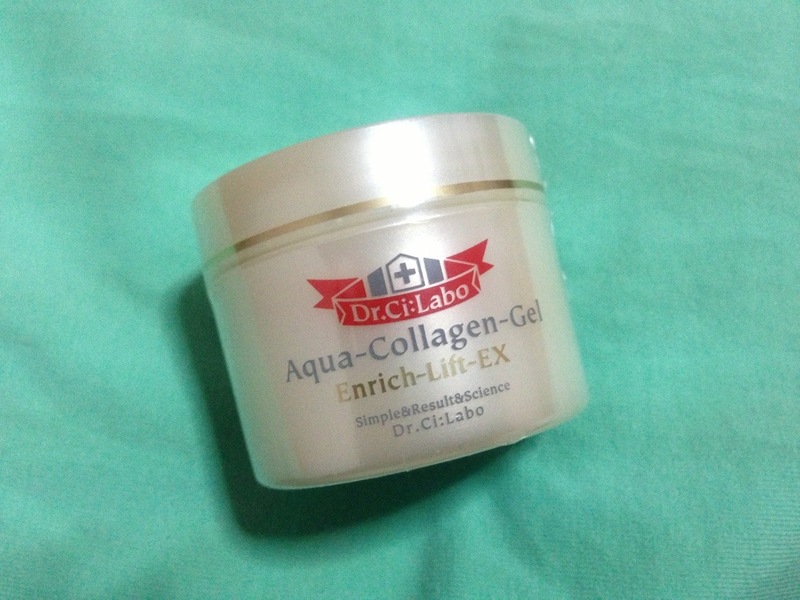 Lets start from the first thing first..
Dr.Ci:Labo Aqua Collagen Gel! This is a 5 in 1 skincare!!! Let me try to find my old post which I had done bef (had rec’d the same sample in Jan Trove)!! 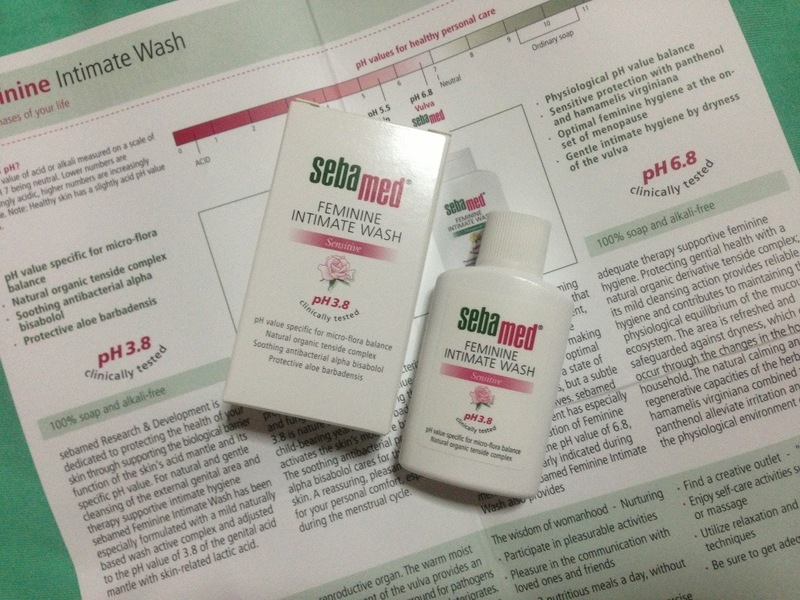 Sebamed Feminine Intimate Wash. This is a soap-free feminine intimate wash for gentle external cleansing with a pH value of 3.8 specific for the microflora balance. 100% soap and alkali free with natural organic derivative tenside complex for extra mild cleansing. Specifically formulated and clinically tested to meet the needs of feminine hygiene for the very sensitive skin of the genital are. As i read on to find what the ingredient.. i saw…”Sodium Laureth Sulfate”! I understand that some consumers doesn’t like SLS.. WHY? Because laboratory studies found that long-term ingestion of SLES (SLS) can cause cancer, tumors, kidney and liver damage in rats. In humans, inhalation has been associated with headaches, vertigo, and eye, nose, throat, and lung irritation. Additionally, some people have an allergic reaction that causes extreme scalp irritation and hair loss. I’m not trying to scare u (LOL), you can do a google search and find many related info on SLS.. HERE is one of the site which i find it quite useful..
Next, we have BATH SALT from Aqua Rine!!! I’m so happy when i see this! Do you still remember one of my recent post on Bath Salt?? i said i wanted to try the Peach Aroma one and.. tadaaaa!! hahahaha! Altho i had the Rose already but i don’t mind sharing with my mom! You can click HERE to check out my previous post! 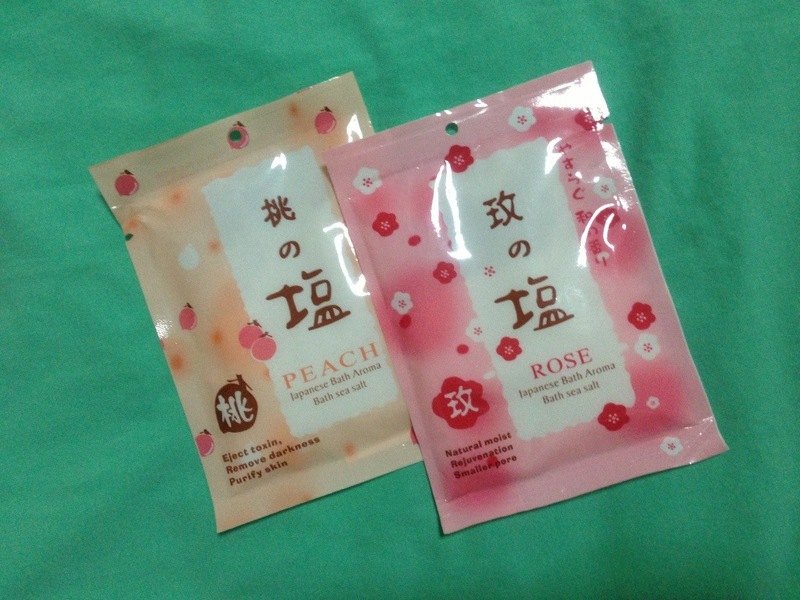 Update as of 27 Apr 2013: Had tried the peach aroma salt! It smell really like peach! Sweet! But I think I still prefer flora.. The sweetness of the peach makes me feel as if the ants will kidnap me when I slp!! Flora (rose/sakura) aroma salt is much soothing and ease my slp! LOVE!! 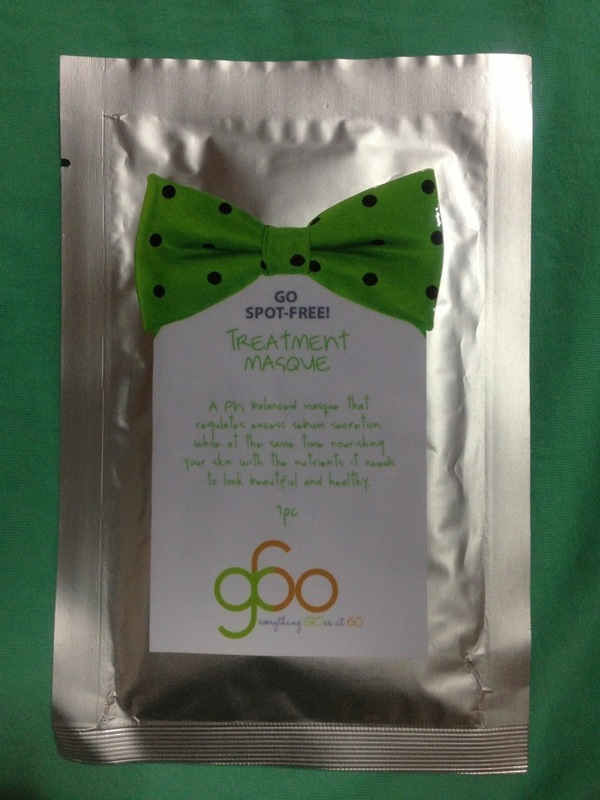 Next up, we have Go 60 Treatment Masque! Read from their site, seems like they’ve stripped their price structure right down to a single flat fee of $60 for any service. That means no more price uncertainty! Best part, it is stated in their website that there is no hidden cost or hard sell!! Now I can do my treatment at peace of mind! No more “peer pressure” and burnt a hole in my pocket for purchasing unwanted packages!! Have I not talked about my masque?? Hahaha! 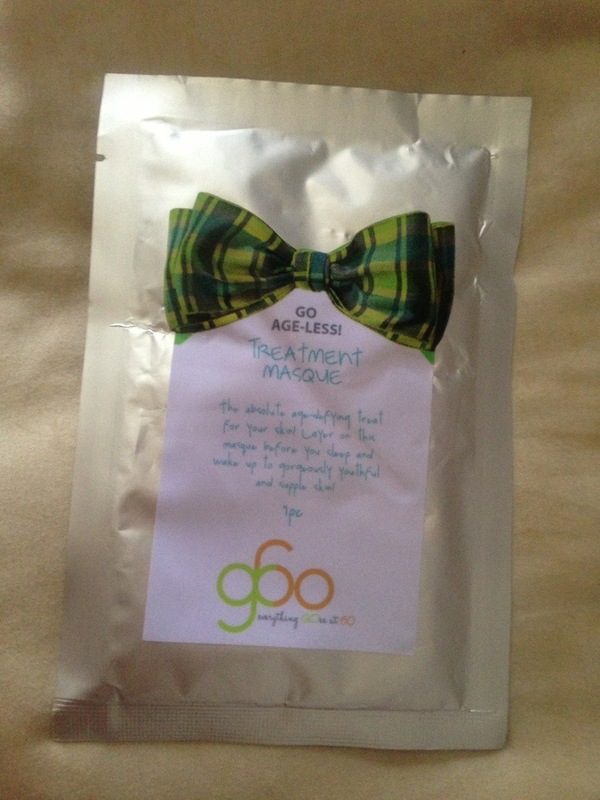 The masque I’ve got is a Treatment Masque. 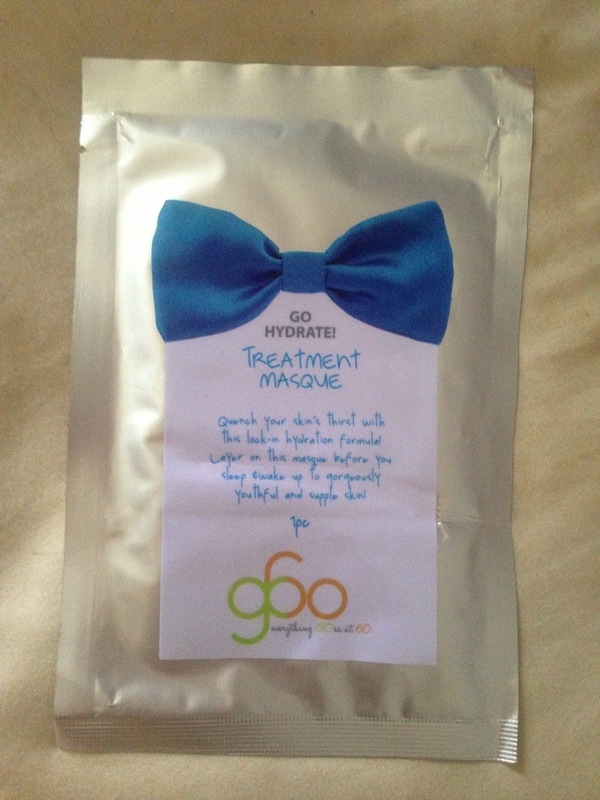 I can’t find anything online about it so all I can share now is that this masque is selling at S$60 for 5 pcs! That’s $12 each! I’m gona share more about it after I used this..
Oh and…. That’s not all!! VT subscribers have got extra treat!! Complimentary treatment to be used by 15 June!!! That’s worth $60 already!!! 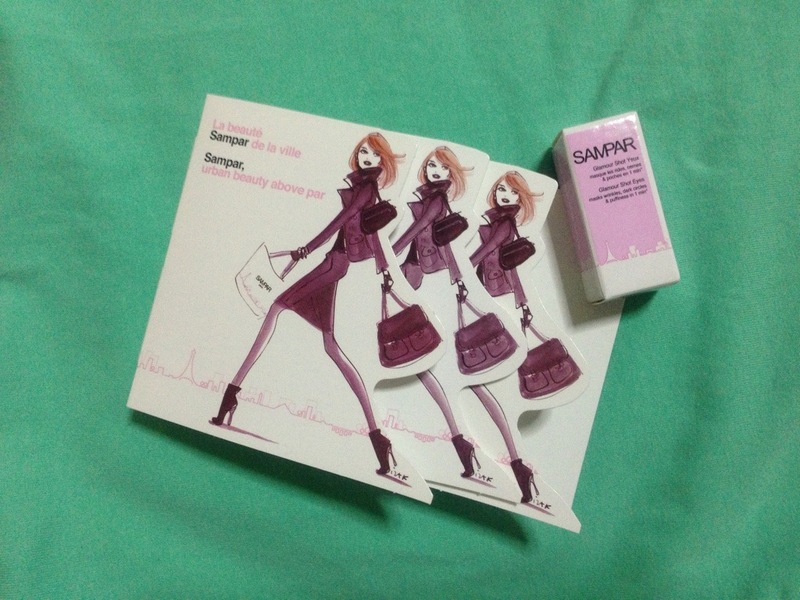 Last but not least, we’ve samples from Sampar!!! This round’s sample is different from what I’ve got previously!! We have Nocturnal Line-Up Mask, Street A Peel, Ultra Hydrating Fluid and Glamour Shot Eyes!! Elaborated after 24 months of research, Nocturnal Line-Up Mask offers the 1st overnight mask to reclaim youth, boost collagen, elastin and hyaluronic acid. A sophisticated alliance of advanced technology and over 90% of natural elements. Ingredient: Adenosine, a cutting-edge active ingredient, boosts nighttime production of collagen, elastin and hyaluronic acid. 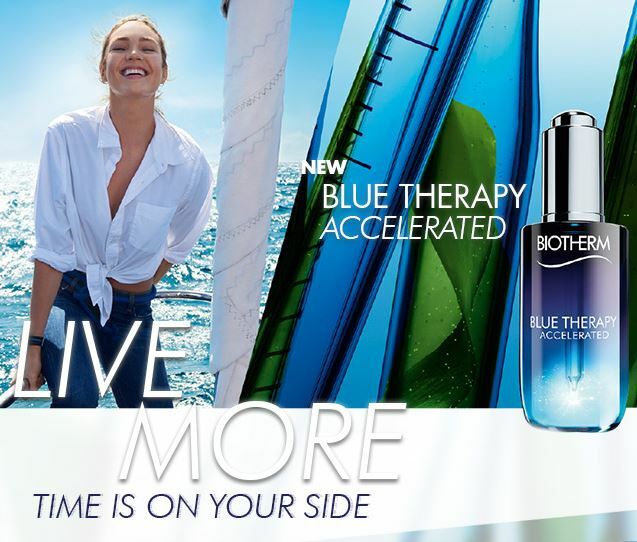 Biopeptides minimize the depth and length of wrinkles by encouraging cellular renewal. Soy isoflavones stimulate cellular renewal. Urban Advance Complex, a powerful alliance of 3 active ingredients (shea butter serum, mint endorphin and probiotic sugar), acts as an anti-oxidant shield, neutralizing any cutaneous imbalances linked to pollution, strengthens the skin’s natural defenses and shocks the skin back to life on a cellular level. 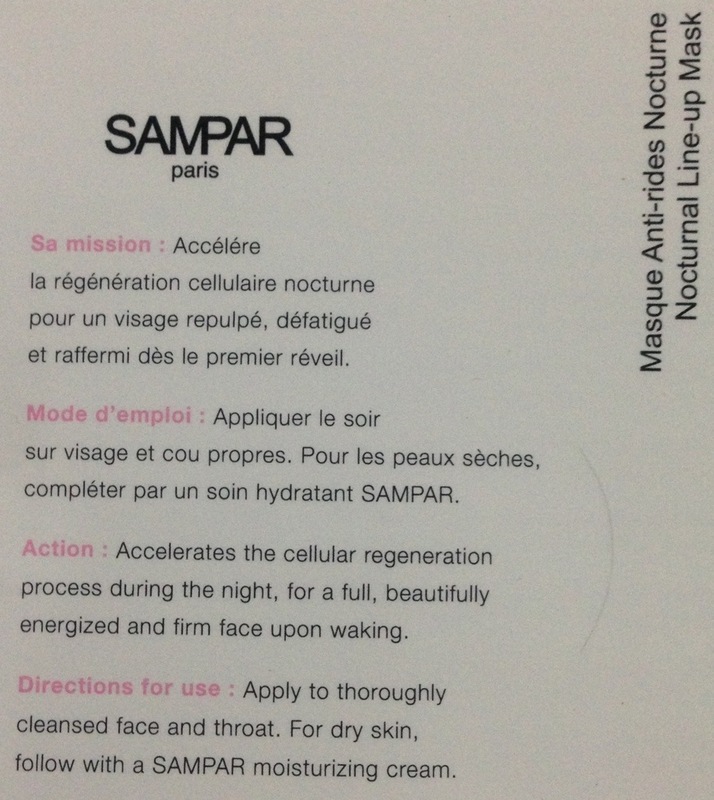 How to use: Apply on perfectly cleansed face and neck before bedtime. Rinse upon waking. Naturally and remarkably beautiful with or without make-up! So what’s the secret? Light! 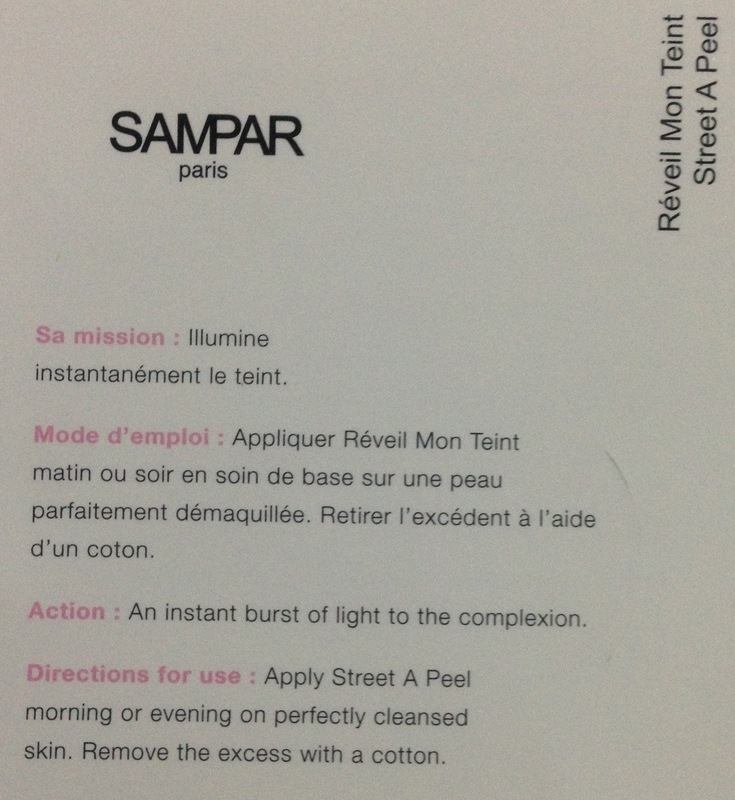 And Street A Peel has the power to reveal your skin’s natural glow. This fresh and milky fluid exposes the skin’s softness, awakening your face’s sleeping beauty and making you irresistible in the eyes of others. Ingredient: Keratolin enzyme expertly lifts away the superficial layer of the skin, instantly revealing its true radiance and clarity. 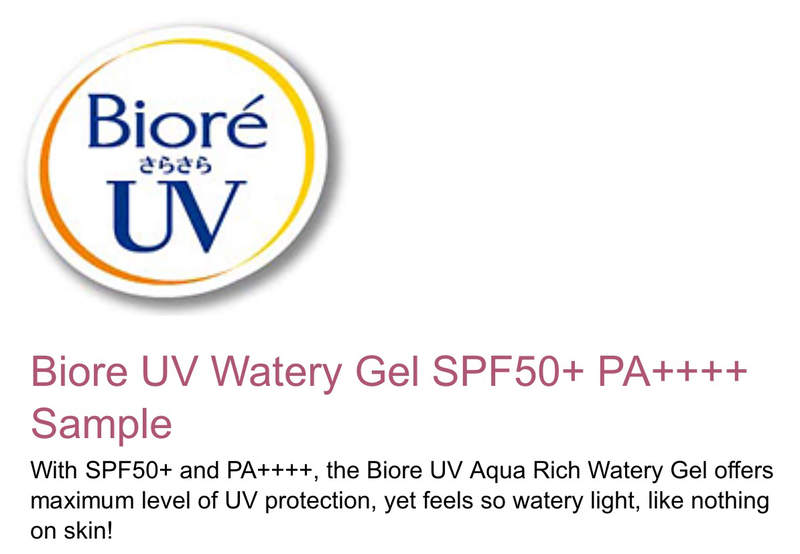 Vitamin B3 works deep in the skin to prevent unwanted darkening. 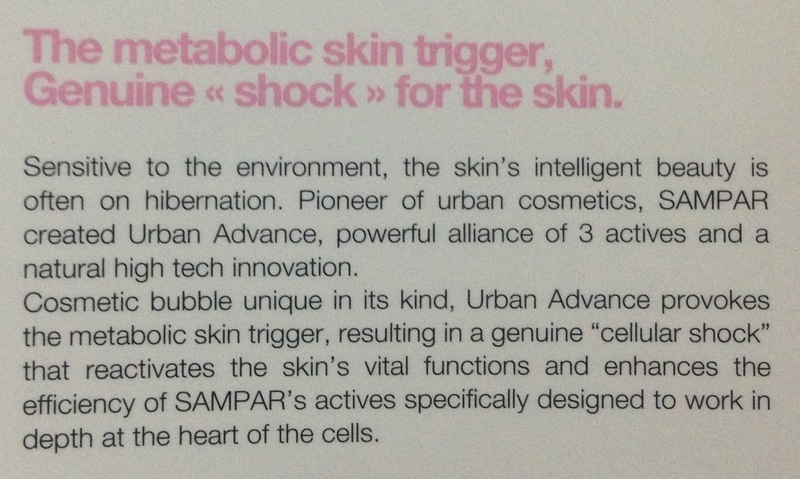 Urban Advance Complex, a powerful alliance of 3 active ingredients (shea butter serum, mint endorphin and probiotic sugar), acts as an anti-oxidant shield, neutralizing any cutaneous imbalances linked to pollution, strengthens the skin’s natural defenses and shocks the skin back to life on a cellular level. 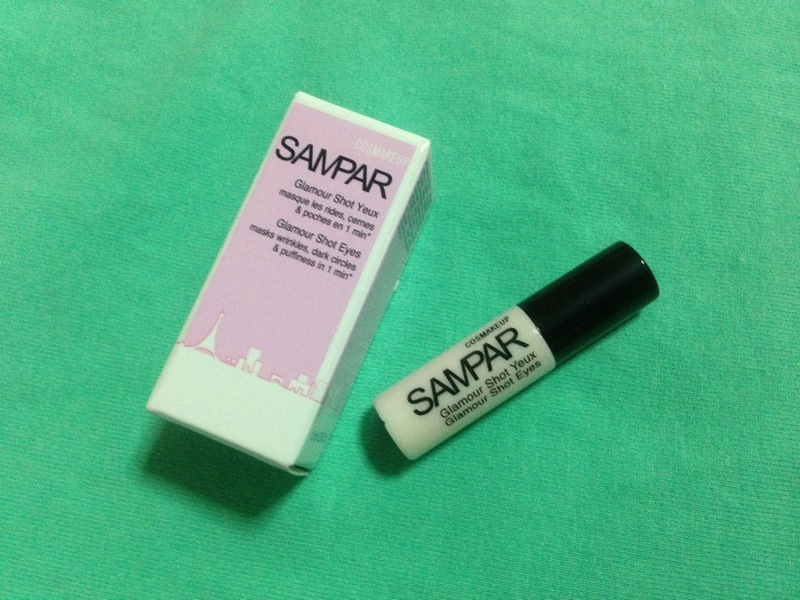 How to use: Apply in the morning and/or evening as a foundation cream on make-up-less skin. Intense hydration is your first defense against early wrinkles, and Ultra Moisturizing Fluid quenches thirsty skin, strengthening restructuring mechanisms and protecting it all day long. Ingredient: White lupine extract provides extended moisturization. Hyaluronic acid, a naturally powerful skin moisturizer, locks in water molecules, immediately reducing lines and wrinkles. Urban Advance Complex, a powerful alliance of 3 active ingredients (shea butter serum, mint endorphin and probiotic sugar), acts as an anti-oxidant shield, neutralizing any cutaneous imbalances linked to pollution, strengthens the skin’s natural defenses and shocks the skin back to life on a cellular level. 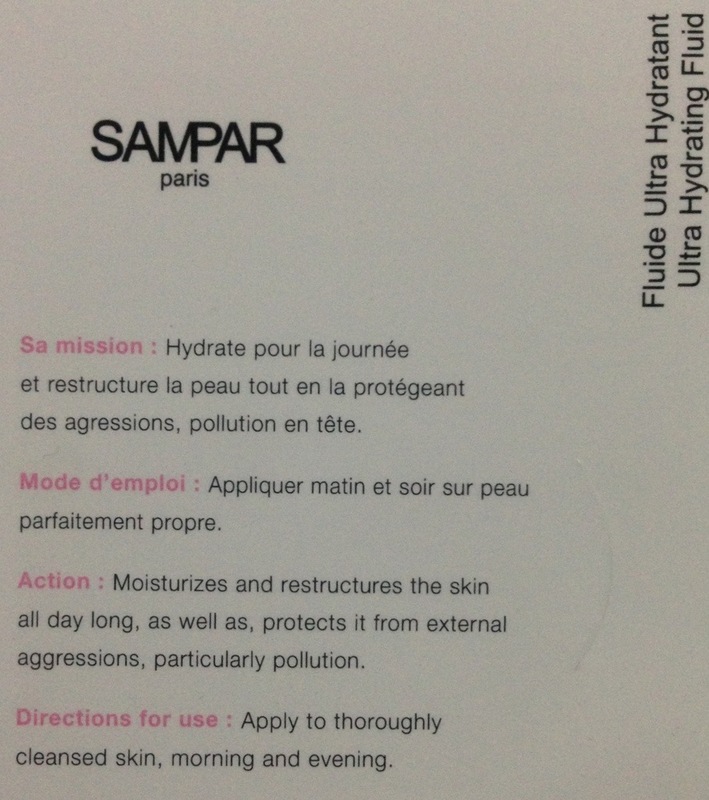 How to use: Apply on perfectly cleansed skin in the morning and evening. In 1 minute, this multi-action glamour revealer erases dark circles, brightens the dark areas around the eyes and blurs under-eye wrinkles and fine lines. As if that wasn’t enough, its formula enriched in hyaluronic acid offers a long-term and lasting anti-wrinkles action. Ingredient: MIB Complex helps eliminate puffiness and dark circles, thanks to its anti-oedematous, anti-inflammatory and veinotonic properties. HQA Microlens, newest generation of soft focus, fill in furrows and lines so that light is reflected off the skin homogeneously, visually erasing imperfections and illuminating the eye area. 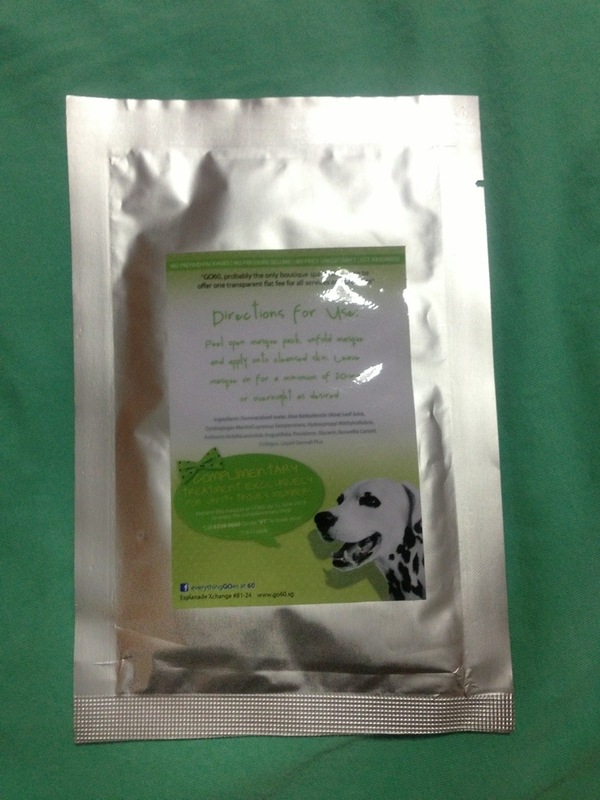 Oat Extract provides an optimal and immediate lifting effect. Encapsulated Hyaluronic Acid enables targeting of wrinkles and fine lines from within and plumps the eye contour for a long-term anti-wrinkles action. Urban Advance Complex, a powerful alliance of 3 active ingredients (shea butter serum, mint endorphin and probiotic sugar), acts as an anti-oxidant shield, neutralizing any cutaneous imbalances linked to pollution, strengthens the skin’s natural defenses and shocks the skin back to life on a cellular level. 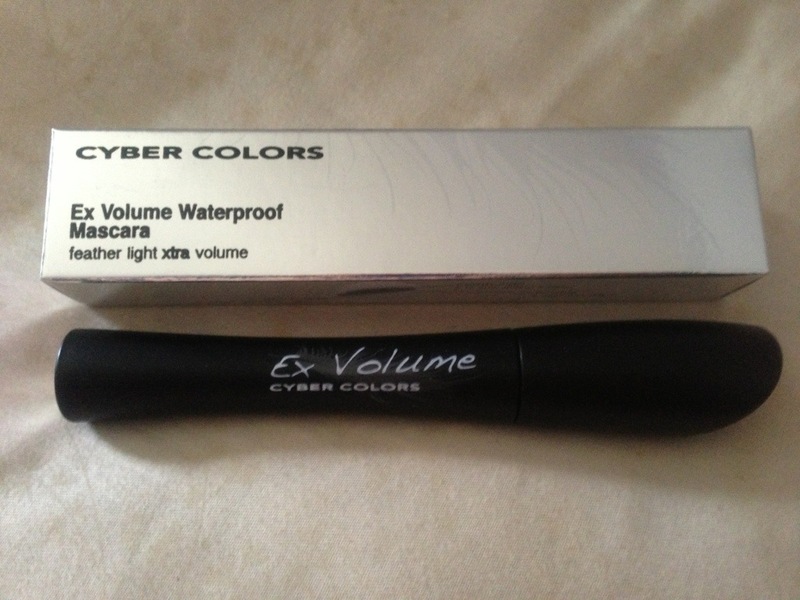 How to use: After fully moisturizing the eye contour, dab a bit of product under the eye with the applicator. Lightly tap with fingertips until the product is completely absorbed. Apply make-up after 5 minutes. This is a really SMALL sample!! LOLX! But sure enuff to last quite a while bases on my previous experience.. So now u’ve seen all the items I’ve got, what do u think?? Tempted to get your very own Vanity Trove too?? Hurry before it closed!! The next trove theme is Summer Crush!! Click HERE to get yours now! !